Somali forces clashed with al Qaeda-linked militants in the capital city Friday after the militants attacked an African Union peacekeeping station, according to an independent media report. Al Shabaab militants attacked the African Union Mission to Somalia headquarters in downtown Mogadishu, according to Somalia’s independent Shabelle Radio. The attack sparked a firefight with government forces, Shabelle Radio said This is the latest fighting in Somalia’s war-torn capital in the ongoing war between government forces and the Islamist militia. 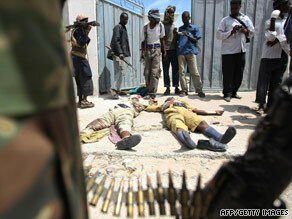 At least 46 people have been killed and 65 wounded in two days of fighting in Mogadishu, Somali officials said Friday. The government forces are being aided by the African Union’s peacekeeping force, which is mainly made up of Ugandan and Burundian forces. Meanwhile, the al Qaeda-linked Islamist militia seized control of the central town of Bulo Burde from government forces, killing 15, Shabelle Radio and witnesses said. Bulo Burde is about 155 miles (250 kilometers) southeast of Mogadishu. Ongoing clashes between the two sides trapped people in the town Thursday, witnesses said. A spokesman for Somalia’s president announced Thursday morning that pro-government fighters had seized control of Bulo Burde, which is considered a strategic town because it lies on a major road between Mogadishu and Somalia’s central regions. But later in the day, after residents reported heavy fighting, the Islamist fighters regained control of the town and the pro-government forces withdrew to about a kilometer outside Bulo Burde, witnesses said. The United States is supporting Somali government’s fight against the insurgents, including providing weapons to government forces. Al Shabaab is on the U.S. list of terror organizations because of its ties to Osama bin Laden’s al Qaeda network. U.S. officials are concerned that Somalia’s weak government could fall to the Islamist insurgency, as it did in 2006 before Ethiopian forces ousted the militants from power later that year.